Australia Threatened again by 2 Cyclones;...updated on International Page Today. Latest Weekend forecast.Mumbai Page Updated. Shimla saw a light spell of snowfall in the evening, nearby places like Kufri and Narkanda have been experiencing moderate snowfall since morning, according to a Met official. Manali too received moderate snow.Keylong, the headquarters of Lahaul and Spiti, recorded about 26 cm of snow, while it was 4.9 cm thick in Kalpa in Kinnaur district. Nepal is battered by F2 today. Kathmandu had day long rains and very heavily overcast skies. With 39 mms of rain during the day, the mercury could manage 10c as the high ,actually it was recorded in the morning itself, and the low was only 9.7c . Several regions of Nepal got unprecedented precipitation. Normal life in hilly districts in mid and far western development regions has been affected due to incessant rain and snowfall for the last two days. Flights to Jumla, Humla, Kalikot, Bajura and other districts from Nepalgunj and Surkhet have been canceled. Snowfall hits Rukum lives as normal life in Rukum district has been affected. Due to incessant snowfall since Tuesday evening, Taksera, Ranmamaikot, Hukam, Sisne, Gotamkot, Jang witnessed the snowfall up to 4ft. Effect of F2 will be over in Nepal from Friday, or earliest by Thursday night. The system along with its precipitation is moving into Bhutan and the NE states . Particularly, Arunachal. 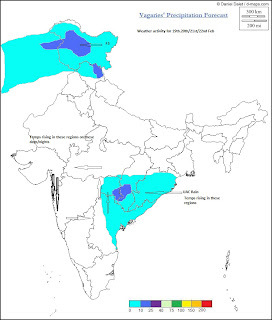 A UAC is forming due to wind convergance in Central India. 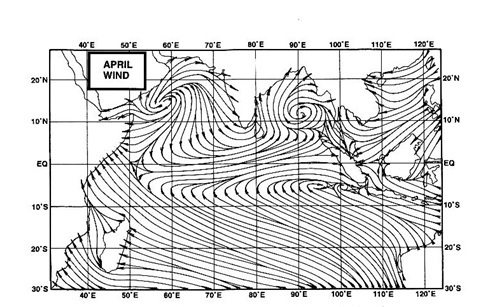 With winds Moving anti-clockwise as is normally in a system, it will generate fairly strong Northerlies in western Mah. (Konkan included) and moderate Southerlies in East Vidharbh/ Chattisgarh on from Sunday thru Monday. Some precipitation could be expected in Orissa, Chattisgarh and East Vidharbha as a result on Sunday/Monday (20th/21st).But cloudy weather, and mainly medium alto-stratus clouding in Central India on Sun/Mon/Tues will bring warm and stuffy weather to the region. At the same time, F3, would approach N. India via Pakistan. The precipitation effect of F3 would be restricted to Central/Northern Pakistan on Saturday and Kashmir and H.P. region of India on Sunday. The system will be fed by the moisture remaining from F2. Since all the "action' is from Sunday thru Tuesday for India, and to make it simple, vagaries has put up a forecast map for these days. Simpler to grasp the precipitation and winds. F4 is also due ,maybe from Tuesday in Pakistan, and then into India. Lets leave the discussion on F4 for later ! I think the highest 24 Hours rainfall record for the month of February is broken. According to meteorological department website, the previous record was 25 mm on 4th Feb 1987.